The 20 Worst Sub Experiences Ever!! 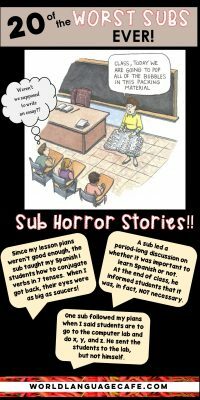 As I was writing my last post, “Why Subs Fail (and How to Help Them Succeed)“, I heard lots of sub plans horror stories from all of you and just had to share. Before we get started, let me just say that there are lots of really amazing subs out there who follow our lesson plans to the T and go above and beyond for very little pay. To all of you – Thank you, thank you, thank you! You guys are AMAZING and we really appreciate you. This post is not about you – it’s about those other subs – the crazy ones . . . . Without further ado, here are 20 of the worst sub experiences EVER!! 1.I had a sub that thought the lesson plan I left was not good enough so he spent the entire class period teaching my Spanish 1 students how to conjugate verbs in seven tenses. When I got back their eyes were as big as saucers. Haha. They all thought none of them would ever be able to speak Spanish after that. 2. Another sub found my candy stash and let them have at it. It was mostly gone. $100 worth probably! Now I hide it. Or count it out. 3. I once had a sub open a period-long discussion on whether it was important to learn Spanish or not. At the end of the class, he informed students that it was, in fact, NOT necessary. 4. Long-term maternity leave sub for a colleague. Decided to not do plans and showed the movie “Superbad”. When the colleague came back, she stopped counting around 90 spitballs she scraped off the classroom surfaces. 5. A sub left my kids at 2:30. She told them, “I have to meet my nephew to get an oil change. See you tomorrow!” She left them completely unsupervised for the remainder of the day. 6. My sub decided to read my notes on my desk for my school board meeting about convincing the school to allow me to go to another country. She decided that she should call a bunch of companies and get price quotes pretending to be me or my co-worker. I now get harassed by many companies every year through email, my personal cellphone, and my school phone. 7. I once had a sub tell my students that it isn’t, “me llamo” it is “me llamo es” AND she told me because they didn’t know it right. 8. A frequent sub at my school prefers to teach tai chi and convert them to his church. 9. A sub sat in the back and did watercolors all day and asked the kids to borrow a phone charger. When no one had one she just unplugged someone’s from the charging station and plugged hers in. 10. My kids once admitted that my sub said he wouldn’t make them do the assigned work as long as they could answer one of his trivia questions. 20 Worst Sub Experiences Ever! 11. Having a different sub in the morning than the afternoon. The morning sub took the plans with him and the afternoon person had nothing!!! 12. A lot of our subs fall asleep at the desk. Or are on the phone the whole time while the kids do nothing or destroy the classroom. 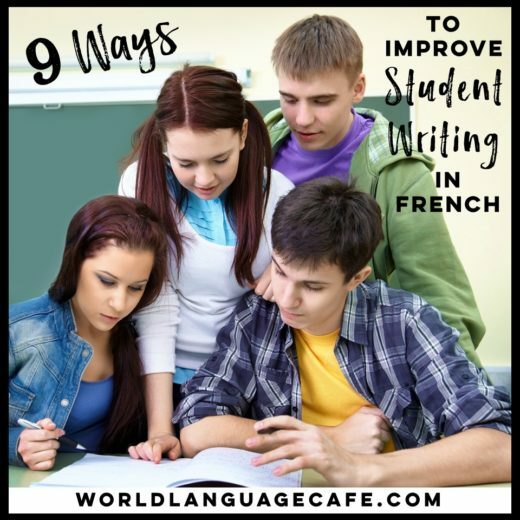 Many students end up skipping classes to go join the class with those kinds of subs. 13. One sub didn’t want to do my plans and told the kids that all they had to do to speak Spanish was to say an English word with an accent. 14. I once had a sub tell the principal that I didn’t leave any lesson plans. She wrote the notes to me about how the day went on the margins of the lesson plans. 15. My sub couldn’t find the lesson plans. My note in the office said they were on my desk. I had put them on my table. In the front center of the room. Where any normal person would stand to teach anyhow. 16. One sub followed my plans when I said students are to go to the computer lab and do x, y, and z. He sent the students to the lab, but not himself. 17. One time when I was out, my classroom became so loud that the teacher across the hall came to check on it. She opened the door to find my kiddos doing whatever they wanted while the sub was sitting on the floor behind my desk reading a book. 18. My daughter was in math class with a sub who seemed to have some unresolved anger issues. She threatened the class and then flung a kid who was misbehaving across the room in his chair. My daughter said they all sat up straight in their chairs after that. 19. Instead of doing my lesson, the sub showed funny and inappropriate cat videos FOR. 45. MINUTES. And drum roll, please, for the all time worst sub experience. . . I got a sub on the day of the eclipse. I left the lessons plans all related to the amazing event, which we had been working on and expecting with much excitement. In my return day after, I was confronted by all these high schoolers, panicking with fear that the end on the world was coming in a week and all of them most likely would end up in the eternal fire pit, especially the homosexual students and such. She told them, they were doomed and that she knew all this because she could read the future and see visions of the upcoming fearful events. It was a mess! By the time I went to the office to speak about it, they already had decided to never call her back, because the students had gone home and told the parents about the awful day with the sub and that the end of the world was upon them. While compiling this list, I also heard from many teachers in support of subs and how hard they work. Listen to what they had to say . . . .
Subs are wonderful and do not get enough respect from teachers, students, or administrators. It is the students who don’t listen to them or show them any respect or do any work for them that are the problem. Listen up, guys. I am a certified Spanish/French teacher with 6 years of classroom experience. To get health insurance between my job as a public librarian and another nonteaching position, I WAS A SUB. Let me give you a different perspective. I very much appreciated organized teachers who left crystal clear sub plans. It also helped if they indicated if students had behavioral and health issues. It was also very nice if neighboring teachers could give me guidance when I had a question, rather than me having to call the office. In fact, regarding that point, I was more likely to return to schools where I got support from fellow teachers, and often the most supportive colleagues were at the “bad” schools. They were very helpful because they were so grateful to get a sub, they would do anything to help out a sub, begging me for my phone number and e-mail. . . . I agree, there are terrible subs out there, but do think about any and everything you can do to make a sub’s day easier, like not leaving a bunch of acronyms in a lesson plan for a sub to have to ask others about. I’ve been a sub before, too, so I know that many teachers overlook these kinds of things and don’t realize that the sub doesn’t have each school’s bell schedule memorized. It also helped me realize how much of my routine just feels like second nature to me, but should be broken down into explicit steps for the sub, because I have been on the other side. Having subbed, I’ve seen both sides. I definitely think it helped me create better sub plans for when I’ve had to be absent. I’m just happy when a sub picks up the job! As long as there are no fights, no one cries, and nothing gets stolen … that’s a win in my book! Really interesting to hear all these stories and perspectives, right? Help your subs succeed by leaving them the information that they need. 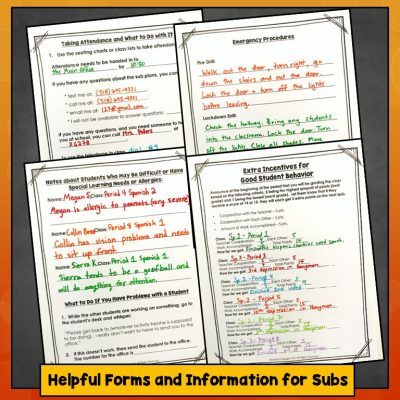 Get these sub plans forms in my Free Resource Library. Sign up here and then check your email for the link and password. 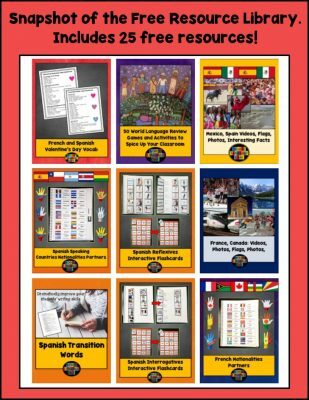 There are over 25 other free resources in the library – trust me – it will feel like you just won a big gift basket full of awesome lesson plans! 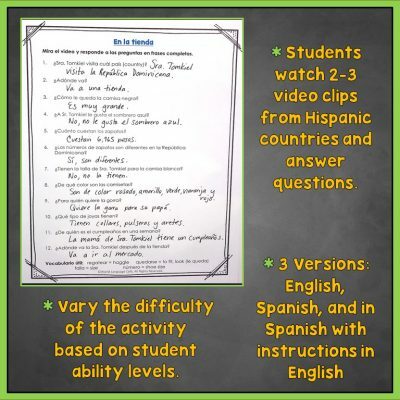 Want some ready-made Spanish sub plans and French sub plans that you can email to your Department Head in a pinch? They include 3 versions: regular plans, emergency plans, and plans for use with Google classroom that can be used with levels 1, 2, or 3. 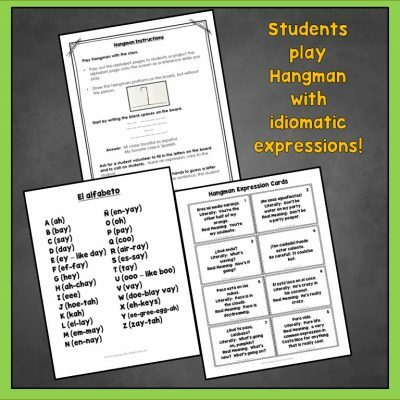 Lots of differentiation so you can pick the perfect level for your students and be guaranteed that your students will be learning while you’re gone. Interested in learning my best tips and tricks for helping subs succeed? Check out my previous post in this sub plans series, “Why Subs Fail (and How to Help Them Succeed)”. 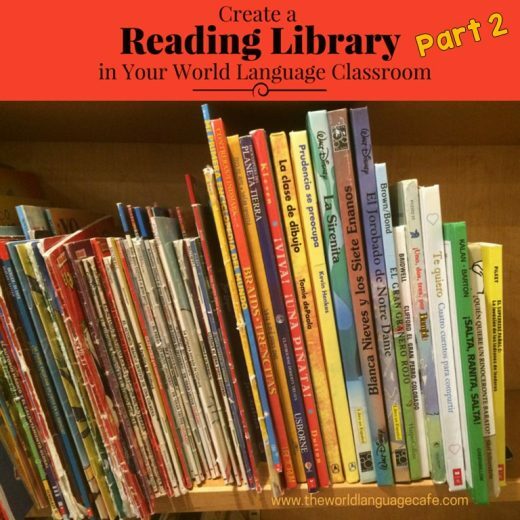 If you have other stories or tips that you think might make a great addition to this series, let me know via email at: worldlanguagecafe@gmail.com.